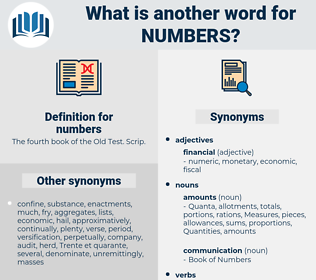 What is another word for numbers? The fourth book of the Old Test. Scrip. Resources, trends, Records, indicators, Grants, Les, Cas. numerals, RSS, references, ratings, readies, boosts, data, numbering, facts, cases, Cas. percentages, proportions, registrations, Measurements, surnames, Measures, requirements, designations, Concentrations, statements, revenues, thousands, reductions, Frequencies, resolutions, establishments, occurrences, ratios, estimates, masses, Expenditures, Abbreviations, sections, influxes, Resources, Households, sums, ranges, Addresses, predictions, accomplishments, forenames, determinations, trends, computations, interlocutors, settlements, substances, stockpiles, prostitutes, particulars, presents, Demographics, inscriptions, performances, coefficients, jobs, workforces, Persons, professionals, Records, outcomes, contributions, results, dimensions, Incidences, Investments, complaints, Databases, amendments, Co-ordinates, contributors, investigations, tiers, ranks, allegations, identifiers, residents, coordinates, variances, Schedules, inputs, millions, sources, projections, Inventories, recruits, staffs, documents, routines, Separations, differences, Entries, Identities, benchmarks, Securities, streams, consumers, subsections, Respondents, Newsletters, rules, catches, surpluses, Budgets, partnerships, factors, Ones, markings, Casualties, headings, patterns, positions, settings, situations, labels, recipients, indications, accessions, certificates, outputs, shares, departures, collections, groupings, Regulations, Surveys, Categories, variations, participants, citizens, audiences, integers, quotas, instances, declines, Characters, locations, groups, clearances, Achievements, Indexes, Indices, Publications, reports, clusters, uniforms, members, parameters, requests, visitors, attendees, returns, enquiries, acronyms, allowances, nominations, indicators, aggregates, harvests, peacekeepers, exemplars, Periodicals, targets, symbols, expenses, Movements, phones, Students, herds, tolls, songs, seekers, candidates, informants, rows, Grants, norms, individuals, stakeholders, sectors, releases, batches, Infections, features, Magazines, tricks, referees, men, editions, changes, degrees, Capabilities, searchers, Seizures, examples, supplies, Soldiers, centres, plaques, TENS, Injuries, invoices, crowds, applicants, doses, proposals, inflows, Charges, clues, Forms, Keys, signs, captures, counterparts, Gentlemen, inhabitants, challenges, sites, arrivals, Specialists, Communities, claimants, debts, Referrals, claims, grades, intakes, limits, citations, types, applications, comments, Bodies, drogues, panels, dials, kinds, sets, payments, partners, contacts, crops, licences, Fees, Colonies, places, centers, accidents, Duties, women, blocks, Copies, flocks, holdings, victims, players, incidents, deaths, owners, calls, flows, articles, fluxes, Classes, warheads, nouns, sides, droves, dollars, books, posts, pillars, Deliveries, Pupils, units, chapters, auditors, pieces, highs, workers, plates, heads, projects, Taxes, teachers, Plants, actors, visits, experts, offices, trips, Facilities, awards, officers, LINEs, references, ratings, numerous, data, facts, cases, presence, presences, sizes, abundance, abundances, strengths, numerics, scores. 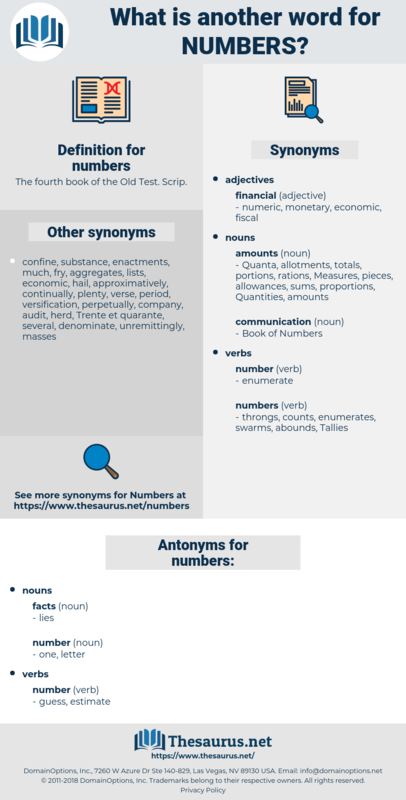 estimates, Persons, indicates, comprises, intends, includes, compares, relies, consists, raises. Their numbers, however, were striking, and I know not what he thought of the nature of this particular evidence. Off Malicolo good anchorage was found, and the natives came on board, and were so pleased with their reception they returned next day in greater numbers, and whilst Cook was in his cabin with some who appeared to be chiefs, a great noise arose on deck. torah, pentateuch, laws, old testament.